Russian scientists are creating scientific space programs and regaining its reputation as a country at the forefront of research in outer space. It has been almost a year since the Spektr-R spacecraft was launched from the Baikanor Cosmodrome. Developed as part of RadioAstron’s international space program, this was the first Russian spacecraft to be launched in many years. “Over the next few months Spektr-R will be working to find evidence of the existence of super-massive black holes or maybe even 'wormholes',” journalists were told by scientist Nikolai Kardashev, director of the Physical Institute at the Russian Academy of Sciences (FIAN) and leader of the RadioAstron project. The unique astrophysical research device, designed to be used in space, was created by Russian specialists from the Astro Space Center at the Lebedev Physical Institute and the Lavochkin Scientific Development and Production Center. Kardashev believes astrophysicists may soon get their first glimpse of an event horizon – the edge of a black hole. “We are hoping to get an image of the ‘shadow’ of a black hole. If we see light, rather than a shadow, then this means that we are seeing a so-called ‘wormhole’,” said Kardashev in early October, in the beginning of a speech given at a conference held at the Space Research Institute at the Russian Academy of Sciences. A black hole is an object that comes about following the catastrophic compression of some sort of mass. Kardashev noted that, according to some hypotheses, black holes have been in existence since the Universe first came into being. Inside a black hole, the gravitational pull is so strong that even time could be said to freeze. Beyond the edge of a black hole is the point of singularity, where time and space cease to have any meaning. Black holes could be the remains of ‘wormholes’ – i.e., links to other Universes. Scientists spent more than 30 years perfecting the Spektr-R spacecraft. At first, it seemed like a project straight out of a science fiction novel: the first telescope was almost 3,300 feet long, but scientists have now managed to scale it down to 33 feet. It has been said that RadioAstron will become the Earth's eyes – an instrument that will enable humankind to see the Universe. And this is much more than just a pretty metaphor. “When the radio telescope travels far away from Earth, it ‘sees’ things much more clearly. A person cannot determine distance if one eye is covered; he needs to look at something with both eyes to get a sense of depth and perspective. And this radio-telescope that has been released into space will give us the kind of image we are looking for,” said Mikhail Popov, director of FIAN’s Astro Space Center. Using high angular resolution, RadioAstron makes it possible to see far-away space objects in vivid detail. Research methods are being discovered that take things to a new level, and the mysteries surrounding black holes may soon begin to be solved. “If someone was to fall into a black hole, then, in simple terms, according to the modern theory, they could fly through the singularity and end up in another Universe,” said the assistant director of FIAN’s Astro Space Centre, Igor Novikov. At the moment, it is impossible to confirm or deny this theory. But with the help of RadioAstron, it could be realistically possible to study these mysterious objects, discover new characteristics and put forward new theories. Over the next few years launches will continue to take place within the framework of the RadioAstron program. In 2014, the Zenit rocket will send the Russo-German telescope Spektr-RG into space, Yuri Zaytsev of the Space Research Institute announced at the opening of the Day of Space Science in early October. Spektr-RG’s X-Ray telescope will be released into space as part of the international RadioAstron project; it will be the second space capsule in the Spektr space observatory series. “Spektr-RG will study the evolution of stellar systems as well as the formation of white dwarves, neutron stars and black holes,” said Zaytsev. According to Zaytsev, there will be two main research instruments on board the Spektr-RG observatory: the German telescope eRosita and the Russian telescope ART-XC, each operating on its own wavelength. The observatory will be directed towards the Lagrangian point L2, 932 million miles from Earth in the direction of the Sun. From there, orbiting at the same time as the Earth, the Spektr-RG will give us a view of the entire sky, as humans have never seen before. “This will allow us to discover as many galactic clusters as we can, define the cosmological parameters of the Universe, the history of how the Universe was formed and the origins of black holes,” said Zaytsev. 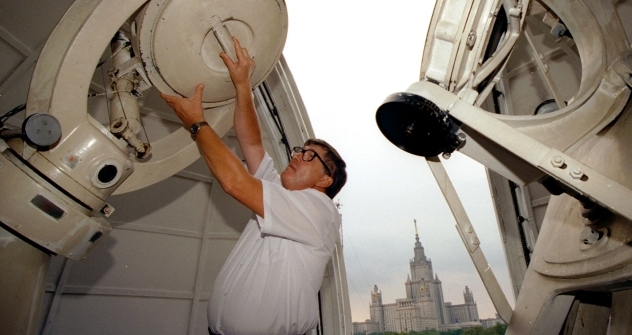 In addition to conducting scientific research, Spektr-RG will also mark Russia’s return to the field of X-ray astronomy after a fifteen year gap – the previous X-ray observatory Granat concluded operations in orbit in 1999. The next participants in the RadioAstron project will be the Spektr-UF and Spektr-M observatories, which operate in ultra-violet and infra-red light bands. “Spektr-UF will be launched from the Zenit-2SB rocket with the Fregat upper-stage rocket in 2016,” Zaytsev said. The RadioAstron program will also be a key international project in terms of finance and economics. Until now, the evolution of space telescopes has mainly continued according to development models of scale, price and technical complexity. The effort that went into developing those telescopes has been worth it – many of these devices are still currently in operation. Since the financial crisis hit, the question of price has become critical: NASA's James Webb telescope, which is currently being prepared for lift-off, is a hot topic at the moment. It costs more than several billion dollars to build. The project will not be called off, but experts have noted that its growing budget has led to spending cuts in other areas of the U.S. space research program.